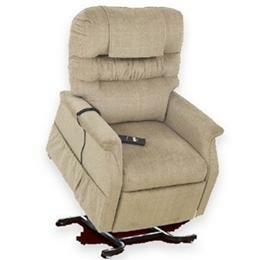 With an ultra soft back pillow and plush seat and arms, the Monarch from Golden Technologies is a very popular mid-priced lift chair. As a three-position lift chair, the Monarch provides assistance and support by offering a reclining position for resting and relaxation and a lift-out position to enable you to transition to standing with ease and independence. A seam style back design gives this chair an impressive appearance along with luxurious comfort. With the unique Golden lifting mechanism this chair will effortlessly take you from fully reclining to a standing position safely and securely. The Monarch is equipped to give you years of comfort and durability. Solid maple hardwood frames, kiln dried and cut to precise angles to eliminate squeaks. Double doweling at stress points and reinforced miter blocks provide extra strength and durability. With just a touch of a switch, the Monarch chair effortlessly raises you into a safe, secure standing position. Includes head and arm covers. Overall Width by Size: 32", 34.5"
Overall Height by Size: 42", 44"
Height (seat to top of back) by Size: 28", 30"
Width Between Arms by Size: 21", 23"
Seat Depth by Size: 21", 21"
Height (floor to top of seat) by Size: 18.5", 19.5"